An early winter’s evening. Full moon, Christmas music in the background, no schedule. Let’s cook ! So, this meatloaf is accompanied by mashed Yukon’s and some steamed brocolli. Pure comfort food! What’s better than that? In a food processor bowl, combine croutons, black pepper, cayenne pepper, chili powder, and thyme. Pulse until the mixture is of a fine texture. Place this mixture into a large bowl. Combine the onion, carrot, garlic, and red pepper in the food processor bowl. Pulse until the mixture is finely chopped, but not pureed. Combine the vegetable mixture, ground sirloin, and ground chuck with the bread crumb mixture. Season the meat mixture with the kosher salt. Add the egg and combine thoroughly, but avoid squeezing the meat. 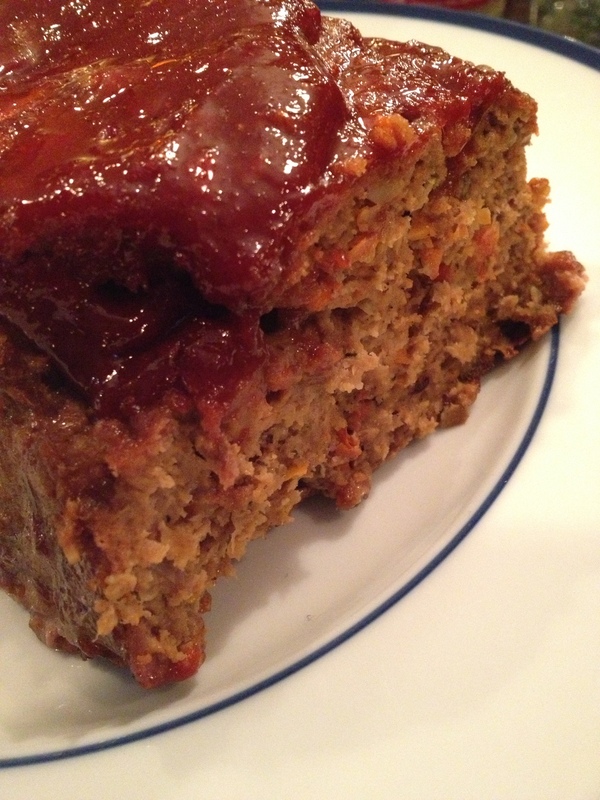 Pack this mixture into a 10-inch loaf pan to mold the shape of the meatloaf. Onto a parchment paper-lined baking sheet, turn the meatloaf out of the pan onto the center of the tray. Bake at 350 for 45 minutes or until the meat thermometer reads 155 degrees F.
Meanwhile, as the meatloaf is baking, combine the catsup, cumin, Worcestershire sauce, hot pepper sauce and honey. Brush the glaze onto the meatloaf after it has been cooking for about 10 minutes. When the meatloaf has reached 155 degrees, remove from the oven and let it rest for 5 minutes before slicing.